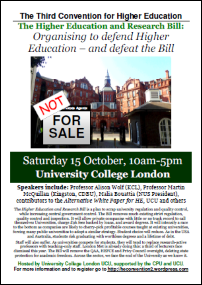 The Convention for Higher Education is an initiative of academics and activists in our sector. Colleagues from the Campaign for the Public University, Council for the Defence of British Universities and the University and Colleges Union have come together to defend our sector. The Second Convention took place on Saturday 27 February 2016 at University College London, as part of a developing campaign on our campuses to respond to the Government’s Higher Education Green Paper. Following the Second Convention, we collaborated on developing a response to the Government’s HE White Paper, which is published as In Defence of Public Higher Education: Knowledge for a Successful Society (The Alternative White Paper). A Third Convention took place in October 2016. 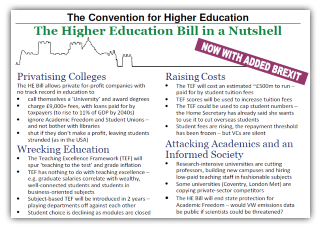 The Government’s White Paper is a blueprint for the privatisation of UK Higher Education through the medium of permitting for-profit corporations to set up as ‘private providers’ and draw on government-backed student tuition fees of £9,000 and more. The White Paper was followed up by a Higher Education Bill in the autumn of 2016, which ultimately became an Act in June 2017. Our Alternative White Paper explains what is at stake. More than a critique, we have endeavoured to explain why Universities have been set up in the current, apparently arcane way to protect academic freedom, and why all who care about the future of UK society should oppose the Government’s proposals. The HE Convention initiative welcomes contributions from colleagues across the sector in defence of Higher Education. The simplest way to get in touch is by posting a comment on our site.